Hello, my name is Cochise Pendleton. I have been writing articles defending God’s Word from Watchtower deception, lies, deceit, and untruth for many years. The Organization has manipulated millions of lives for more than a century. They have destroyed families and effectively murdered children and others by teaching that blood transfusions were God-condemned, so many died as a result of refusing such life-saving transfusions. I will continue to expose Watchtower biblical deception because that is my Christian ministry, but there is another topic that merits attention. Pastor Rick Warren taught from the Saddleback Church platform the subject of health and longevity. He brought in various health care professionals to educate over 40,000 parishioners. They taught us the importance of diet, exercise and the full spectrum of living a healthy life. As a matter of fact, the whole church got involved with health conscious living with prescribed daily routines for optimal health. I mention Pastor Rick’s educational program because I also want to share something on the subject of health. I was recently introduced to something quite profound. Truthfully, I did not believe what I was being told and had a hard time believing the materials I was given to read. But after talking with a doctor and listening to another, I was compelled to investigate. What I found was something so astonishing that keeping it to myself was not an option. This short article will introduce my findings. Autoimmune diseases affect up to 50 million Americans (this according to the American Autoimmune Related Diseases Association). There are about 80 million of them with absolutely no cure. The medical profession has no answers and can only prescribe drugs to treat the autoimmune symptoms. In other words, they have no cure for the causes of the diseases. This brings me to the purpose of this article. If medicine has no answer to these autoimmune diseases (e.g., rheumatoid arthritis, systemic lupus erythematous, Graves disease, inflammatory bowel disease, psoriasis, type 1 diabetes, etc. ), what hope of getting better do we really have? The Father of Medicine, Hippocrates, said, “Let food be thy medicine and medicine be thy food.” Since medicine can only treat the symptoms of disease, is there a food that can actually make a difference? The answer is yes! Hippocrates knew food was the key to health. Although medicine is a good alternative and helps millions, it fails to cure the actual causes of illnesses. If, however, nutrition could actually penetrate the cell wall itself and recharge the cell to its maximum potential, our immune systems would have all the energy necessary to defend against invaders. Therein lies the problem. Our cells are not being recharged. Consequently, as a rundown battery becomes worthless, our cells too become useless when they can no longer recharge. I recently discovered a food that actually penetrates the cell itself and recharges the entire body’s immune system. First and foremost, let me be clear about something. The food I have discovered does not “heal” or “cure” anything. However, because of modern technology, which is explained later in this article, this food is able to bypass our digestive system to the cell itself. As a result of the micronized substance re-charging the cells’ mitochondria, our immune systems become healing machines on overdrive. Through this food, our immune systems become empowered – attacking the causes of autoimmune diseases to bring our bodies back to a healthful state. Remember, age is also a disease. Imagine reversing your age clock. One doctor tested 3,500 peoples’ chronological and biological ages, then tested many consuming the product. Of the people on the product, their respective chronological and biological ages differed by as much as 24 years! Yes, the results were that profound! As I mentioned earlier, I did not believe what I was reading, so I proceeded to investigate. After a few weeks of analysis, I was overwhelmingly stunned. The information you are about to read was taken from Kare’s E-book. Click on the “Purple Rice E-book” at the bottom of this page for your Free copy. Here’s what I discovered: This strain of “forbidden rice” (it was forbidden to eat and was only fed to Emperors of six of the most powerful dynasties because of its powerful anti-aging and strength properties) was lost in history – until now. This high frequency heirloom “purple rice” now meets a modern-day micronizing technology. A unique milling machine micronizes the vital rice until the molecules are so very small that they form a highly charged alpha gluten chain that can easily pass through a cell wall as fuel without having to be digested (even when the cell is insulin-resistant). The multi-million dollar milling machine is able to separate out the heart of the rice (the endosperm) which contains all the ancient and perfect polysaccharides (sugars), all the polypeptides (amino acids – the body’s building blocks), and the outside royal purple covering of the rice which contains anthocyanins (super antioxidants 1,600 times more potent than blueberries). It takes 60 pounds of rice to make only one pound of this powerful product, because only the vital parts are kept. Like arrows of perfect fuel of your mitochondrial battery … it can then produce ATP light energy which is absolutely necessary for health and regeneration. Last, but surely not least, this ancient strain heirloom is growing in a pristine valley in highly mineralized soils which are totally untouched by chemicals, pesticides and GMOs. It is tended by expert loving hands, watered by crystal clean mountain waters, harvested at their peak perfection and carried out by hand because trucks are not allowed in this sacred valley in Thailand. This product is not available in any store anywhere. After listening to Dr. Jack Tips, personally speaking with Dr. Doug, reading testimonial after testimonial, and personally speaking with others that have had profound life-saving stories after consuming this product, the only logical move forward was to try the product for myself. After I finish my first 3 months eating this “alfa PXP Royal from Purple Rice,” I will then have my blood tested for any internal changes and those results will be posted for all to see. Every system in our body requires and thrives on ATP light energy. ATP creates that glow and vitality as each system in your body begins receiving the light energy it needs to power up, repair, regenerate, and function at its highest level. This is the food for anti-aging, and for turning your Light back on! So what does this really mean? Within less than 1 month after I began consuming this food, my salt and pepper facial hair is turning more “pepper.” See my picture below. The short term results are truly amazing. Hello, my name is Cochise Pendleton. As I mentioned above, here is my picture. These pictures were taken by me. 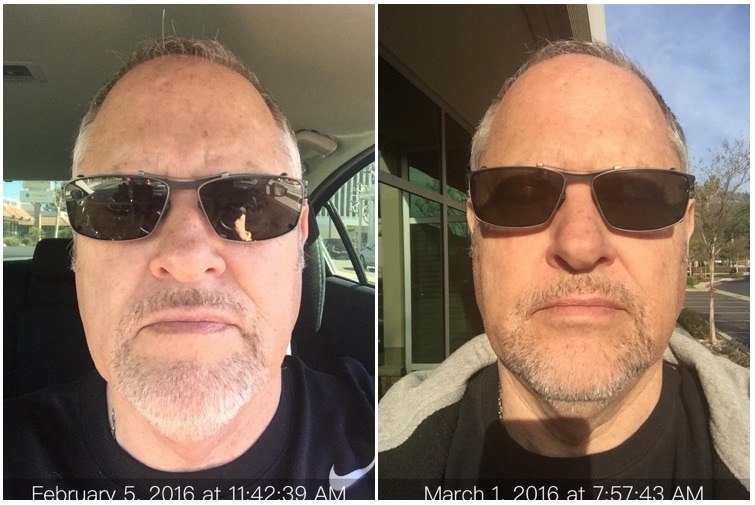 The left photo was taken inside my car on February 5, 2016, and the right photo was taken just one month later on March 1, 2016 . Both photos are time and date stamped. When I took the right photo I was starring directly into the sun so my face would be exposed to as much sun light as possible (I actually had to squint). Neither photo has been retouched. After only 1 month of eating this discovery from Thailand (Micronized Purple Rice), my facial hair is noticeably less white/gray hair. Not only did my goatee become noticeably darker, but the discoloration on my forehead appears to be evening out and the dark spots are disappearing. Also, the crease that runs down the right side of my nose to the top of my mustache is smoothing out. Any doubts I may have had about the effectiveness of this product have just disappeared. My testimony alone is proof positive to me that that this Micronized heirloom does exactly what thousands of people are claiming. I did not believe it until I saw it for myself. After I take this product for 3 months (2 months to go), I will go to the doctor for a blood work-up. I am really interested to see my internal metamorphosis (e.g. glucose number, overall cholesterol, HDL, LDL, and triglyceride totals). At that time, more pictures and my blood results will be posted. I am 62 years old. Living that long you learn how to discern truth from fiction. There is an old saying, “If it sounds too good to be true, it usually is.” Well, that red flag of caution did rise, but after investigating this product and looking at all the empirical data (real people’s lives and their stories, listening to Dr. Tips, speaking with Dr. Doug, and experiencing this on a personal level), I am now able to separate truth from fiction in regards to this Micronized Purple Rice. Because of this, I now champion this food. That said, I now distribute this product but do so at my cost. In other words, what I pay is what you will pay. Since the medical professionals have no cures and no answers to the causes of over 80 auto-immune diseases, the only humane thing left to do is to share this wonderful discovery family, friends, and yes, everyone! As Hippocrates said, “Let food be thy medicine and medicine be thy food.” Well, I just discovered an heirloom micronized food that when fed to the body energizes our immune system to Overdrive status. Better health means a better quality of life. When you feel better and yes, look better, your outlook on life takes a dramatic turn for the better. My mother always said, “Son, without your health, you’ve got nothing, so do everything you can to say healthy.” With the Lord’s help, I hope to do just that. Now my attempt to spiritually help ex-JW’s from Watchtower deception will include helping them and others learn how to become physically healthier through this micronized food. This entry was posted on March 5, 2016 at 9:53 am and is filed under Uncategorized. You can follow any responses to this entry through the RSS 2.0 feed. You can leave a response, or trackback from your own site.